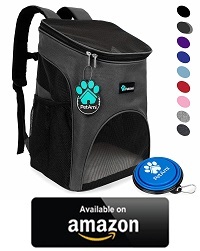 One of the best ways to bring your furry companion(s) with you on vacations, and while you’re traveling, not to mention including them in outings and outdoor activities such as bike rides, and hiking, is through the use of a dog carrier backpack, sling or purse. They can offer you a safe and secure means of bringing your pooch with you, and introducing them to new sights, sounds, and smells, without them feeling overwhelmed. 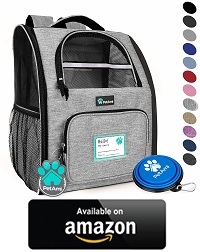 Aside from using a suitable carrier backpack, you can also take your dog out with you, in comfort and style with the use of doggy clothing and other accessories. 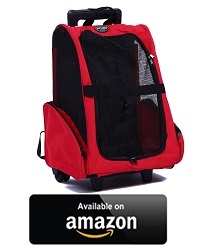 1 Why Would You Use a Dog Carrier Backpack? 2.2 #2 What is the Intended Use of a Dog Carrier Backpack? 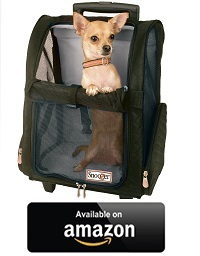 Why Would You Use a Dog Carrier Backpack? There are many reasons for why you may want to consider using a Carrier Backpack or a Sport Sack. It could be due to your individual dog’s needs, activities, or the environment that you might need to bring your dog to. 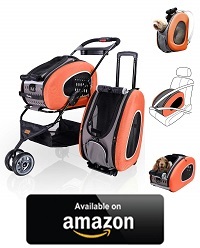 Either way, they can enable you to carry your dog around with you in both comfort and style. Not all dogs are the same when it comes to their fitness, and capabilities. 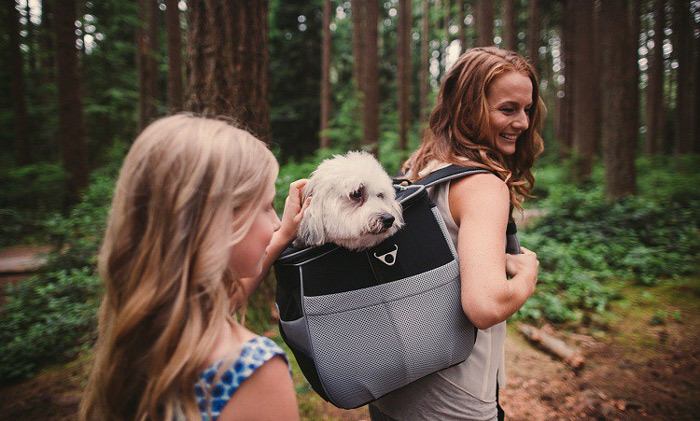 Whether you’re going for a long hike, on off-road adventures, bike rides, or simply going for a longer walk then what your dog can handle, then you may want to consider using a carrier. They are a great way to include dogs that have little stamina, short legs (such as puppies), or have gotten on in age, and are unable to keep up with you. 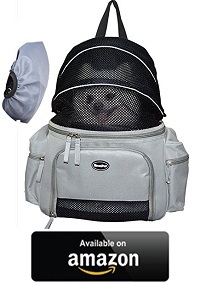 Dog carrier backpacks, are also a great means of transportation for your dog. 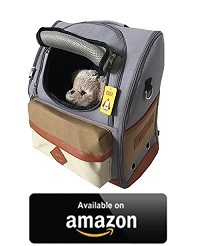 If you need to bring your dog with you on the train, on some domestic flights, or in a taxi, the carrier backpacks make it so you can transport them in comfort. A carrier backpack also enables you to bring your dog with you on motorcycle rides, without having to install a purposely built dog carrier sidecar. Traveling to a new area, or moving house, can be rather stressful for some dogs. A shy or nervous dog may find new sights, sounds, smells, or even crowds to be overwhelming at first. A backpack is a good way to try and keep a nervous pooch calm when you are bringing them to somewhere new. Carriers can provide an extra layer of security for your dog, in crowed, noisy, and unfamiliar spaces. This can make it easier to introduce your dog to their new surroundings if the are the shy type. City life may have a lot more noise and crowds then what they are use to, and the country life may introduce them to strange smells and animals, all of which could be overwhelming at first for some dogs. Another benefit is that while you carry your dog in a carrier backpack in crowded areas, it keeps your dog within your own walking space, and allows you to rest your dog on your lap when you sit down. There are many different styles of dog carriers on the market, each one can be better suited for a different size and breed of dog. When choosing the carrier that would be best suited for you and your dog, there are a few things that you need to consider. 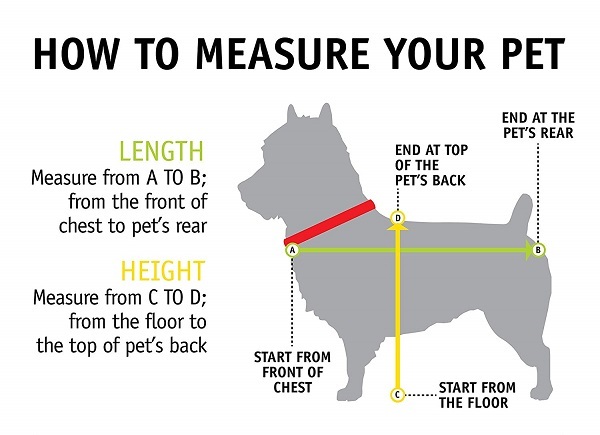 Once you know your dog’s measurements, cross reference them against the requirements provided by the manufactures for their carriers. 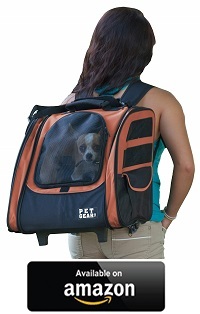 #2 What is the Intended Use of a Dog Carrier Backpack? The design of the carrier backpack, will define its uses and limitations. 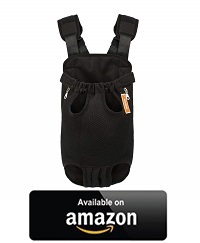 A shoulder strap dog carrier may make exercise and outdoor activities difficult to do while carrying your dog. They are ideal for traveling and functioning as a car seat though. If you are looking to exercise while carrying your dog, be it hiking, riding the bike or simply going for a long walk you may want to consider picking a lighter back that would be more comfortable for you to carry. 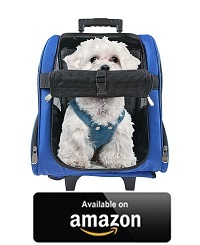 These bags don’t offer as much room for your dog to move, so they may not be ideal for long distance traveling. If you are looking for a multi-functional carrier, you may need to sacrifice some personal comfort, and get a duel function carrier that can be used for both transportation and during exercise. You may also need to consider how quickly and easily it is to get your dog in and out of the carrier. If you are looking for a carrier that can be used to simply carry your dog once it is tired out during a walk, or when you come across terrain that your dog may find difficult to traverse. 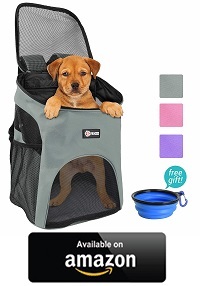 Then using a carrier that the dog could wear or easily jump into, may be a more convenient option for you. After you have determined how you want to be using your dog carrier, there are a few things that can further determine whether or not a particular carrier would be ideal for you and your pooch. Picking the right sized carrier is important. The Goldilocks rule applies here when it comes to picking the right sized carrier. Keep in mind that anything too large or too small will make your dog uncomfortable. If you are carrying your dog for exercise, if it is going to be bouncing around, you will want a more snug fit to help prevent injuries. If the carrier is too small or too tight, not only may the dog if it uncomfortable, they may even find it difficult to breath. 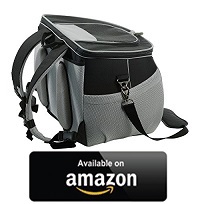 The ideal sized carrier will provide enough support that matches the intended function. 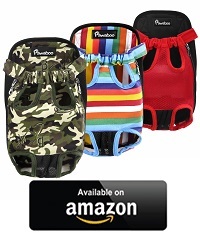 The carrier would so be able to support the dogs weight without sagging or bulging forward under their weight. The fabric should also be soft enough so it does not dig into your dog, and breathable enough, to allow your dog to get a good amount of fresh air circulation. As you will be the one carrying the backpack, it is best to find one that is comfortable for you to carry. The straps need to be wide enough so it does not cut into your shoulders, and the fabric should be soft and breathable so it does not cause irritations. The size and length of the bag will also determine how the weight is being carried. If the balancing of the bag is too high, low or to one side, it can cause strain and fatigue in your lower back and shoulders. Though it is important to provide our dog with enough room for them to be comfortable you would also want to be able to prevent your dog from unexpectedly shifting of their weight. This could cause you to become unbalanced and fall over if not pulled to the side. A sudden weight shift could also cause you to pull a muscle as you try to counter balance/brace. Ask yourself, if you will be using the bag in all weather conditions? Proper air flow ensures that your dog gets enough fresh air and helps to keep them cool on those hot summer days. Water resistant fabric helps to prevent your dog from getting wet and feeling cold if you are caught out in the rain. 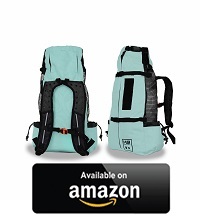 Some carrier backpacks offer a mixture of fabrics for all weather conditions. Others may provide a protective cover that you would need to manually place over the backpack to help keep your dog dry. Making sure that your dog can be safely and securely fastened within the bag is highly important. You never know if, or when your dog may get spooked or overly excised and try to jump out of the bag. If your dog was to take a fall from a medium height, they could easily get hurt. Especially if they got caught up in the bag as they fell, or pulled you down with them. It is best not to rely on just zippers and draw strings to seal off the bag or hold your dog in place. 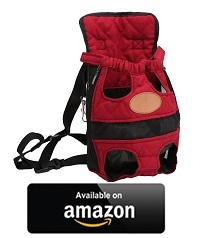 Look for a dog carrier that offers a safety collar anchor system within the backpack itself. This can help to ensure that your dog won’t be able to escape from the bag, or fall out unexpectedly should you lean over in such a manner that there is a risk of the dog tumbling out. Some backpackers offer the option for the pooch to have their legs protruding from the bag. 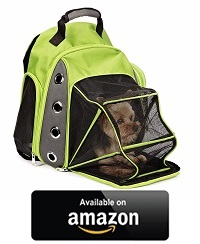 This allows the dog to move and look around, while it is still being securely fastened within its carrier. Not all dogs are comfortable with these sorts of carriers mind you. Whether it’s having their legs sticking out while they are being carried, or the awkward feeling of “wearing” the carrier while they are walking around. It is best to make sure that your dog is comfortable with these sort of carriers, if this is what you are looking to use. If you get tired out from carrying your dog around, you may want to take the carrier backpack off. If the situation permitted, this could be a good opportunity to let your dog out and stretch their legs for a bit. Unfortunately these opportunities are not always available. Which means that you either need to place the backpack down and not move while you take a break, or alternatively you may want to consider getting a carrier with wheels. Some carriers can have the wheels folded down when they’re not in use, others may already have the wheels at the ready. Just like with many travel luggage bags, these carriers may have a telescopic handle for you to extend and pull the carrier along, others may use a lead/strap system instead. One last important thing for you consider when choosing a carrier backpack, is how easy is it to clean. Aside from general cleaning and airing out, one other thing to be mindful of, is that accidents happen. This is especially true when it involves a young pup that may not be fully house broken yet, or an older dog that may no longer have full control over their bodily functions. One work around, is to treat your carrier backpack as if it’s a generic pet carrier, and use pet liners and sanitary pads just in case there are any little accidents. 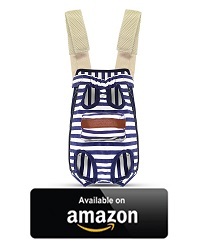 This backpack comes with both waist and chest buckles to give you extra support. 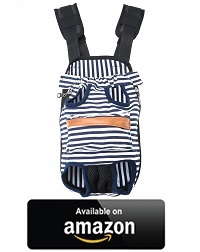 The backpack comes with a safety strap to help secure your pet and prevent escape. Plenty of air flow and durable construction allow you to enjoy the flight, walk, or hike worry-free. 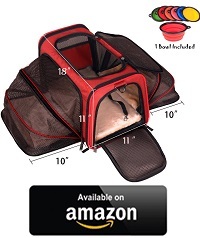 Comes with a thick, cozy sherpa lined bedding so your pet can rest and relax. 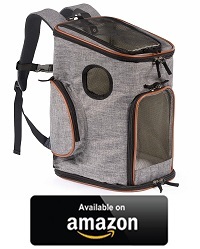 This backpack is firmly structured, providing ample room for your pet to move around. The back and shoulder straps are equipped with extra thick padding for more comfort during long trips. 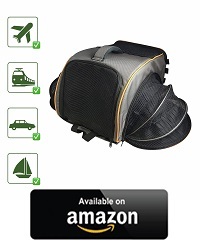 Perfect for everyday use, trips to the vet, hiking, riding, road trips. CARRIER – Passed Environmental Stress-Cracking Resistance (ESCR) test, and SGS quality test. FOLDING CART – High quality wear-resistant wheels with light metal and plastic frame. ACCESSORIES – Stroller Frame. Folding Cart with multistage telescopic handle. Machine washable padding. 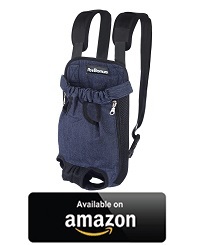 Tether with snap hook X1, adjustable shoulder strap with padding. 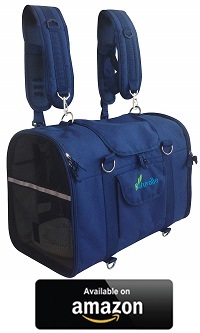 The flexible frame keeps the carrier completely unfolded and protects your pet from getting crushed when lifting it with the handles, or onto your back, front or shoulder. Reflective straps for night travel, hiking, offloading from a car, cab, bus etc.